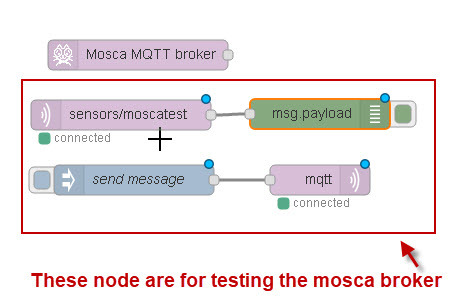 Rather than use an external broker like mosquitto with node-red you can install Mosca which is a MQTT broker written in node.js. Because Mosca isn’t part of the core nodes you need to install it using the npm package manager or through the Node-red Admin control panel. 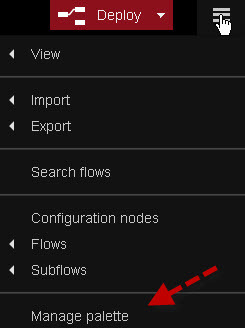 In the node-red admin go to Settings and manage Pallette. Click on the install tab and search for node-red-contrib-mqtt. You should see a list of options. 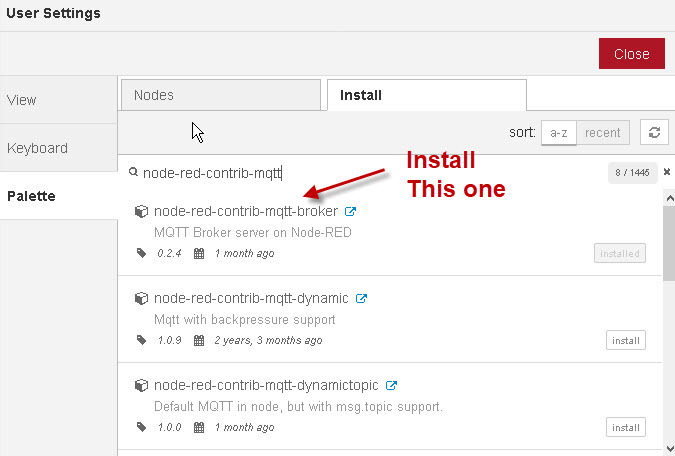 The node-red-contrib-mqtt-broker is the module you need to install. Drag and drop on the Canvas to use. The node properties is a single page and with very few settings. You need to set the ports for standard MQTT and MQTT over websockets. The username and password fields are for the mongodb database,and you can usually leave them blank even when using the database. 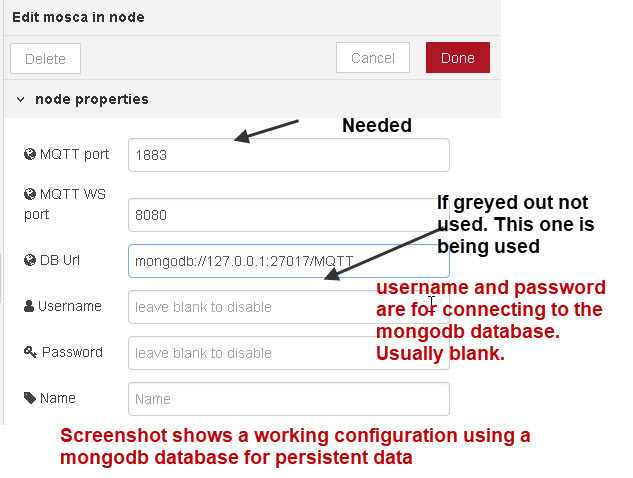 The mongo database is used for persistent data and is usually as show in the screenshot. Note: If it appears grayed out then it is not being used. Persistent data stores unsent messages,subscribes and retained messages so they are remembered if the server is restarted. To use it you will need to have the mongodb server installed on your system. Important Note: This isn’t the mongodb node. The node is a connector to a database server and not the server itself. 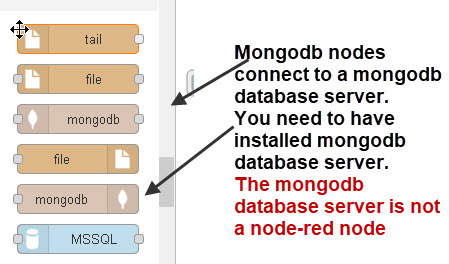 You will need to install the mongodb database server separately it is not a node-red node. You can use any MQTT client for testing the broker.The easiest is to use the MQTT input and output nodes. The Node-Red mosca node is useful for testing it may also be useful for small home automation networks. It is not really suitable for a production environment. I will be watching to see what happens with this node going forward. Hi, I want to send the data of Temperature sensor from ESP8266 to node red. 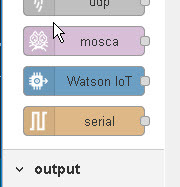 I am using Mosca MQTT broker in node red and using windows operating system make this thing work but due to some issue, I am not able to send the data from esp8266 to Mosca MQTT broker in Node-Red. I made all the steps, everything is ok.
and connect to my broker. I don’t know how to do this, if anyone can help me!!! I have tried using Mosca on Node Red but the system crashes. then it enters a “failed state” and goes into a rebooting loop. I lost the entire program and had to start fresh install. Have you heard of any issues with Mosca? I got crashes when I sent it lots of traffic which is why I couldn’t recommend it other than for simple testing. If you send me your flow I will test it and see if it is a configuration issue. Thats what I thought but when I tested it it didn’t work that way. It did work on the mongodb database fro remote access.